I was once riveted by a play on Broadway (New York City of course) and ever since, have been wanting to sit down and write a similar script. Any assistant script writers out there.....you are welcome to come help me! It was called MASTER CLASS, and it was based on facts and worked for theatre in a clever way. The chief character in that play is one of my favourite personalities in world music - Maria Callas the opera singer. When I wrote my book on M.S. Subbulakshmi, I think somewhere I have mentioned Callas. 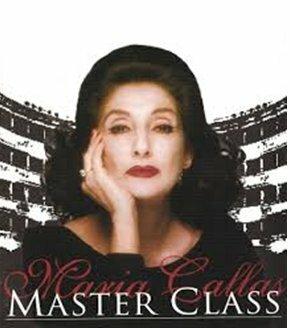 The play as you may have guessed from the title was set in a master class conducted by Callas. What a treat the whole play was! It was a close encounter with the artist as mentor, and revealed a lot about her self-worth, her personal vulnerability, her imperious confidence in her art...... And more! Recently, I dropped in to see the fabulous one and only Vyjayanthimala Bali conduct a workshop for ABHAI. She was amazingly sprightly and so correct about what she taught. The small details such an expert artist can show students are difficult to catch in a big class. However, she was on her feet to show the finer points in a simple Thillana and I sat by her side, feeling privileged to see the real thing. The smallest details in postures and movements had a touch of correctness. ANGA Shuddham is more often than not simply bandied about as a catch phrase. We see today, more and more ANGA distortions than ever before. What to do? Indeed what can be done? Hmmmmm.....I think high level teacher training is needed. Teachers need to re-vamp their understanding of basics. Why should they think they know everything? And, even if they do know everything, there may be details which need cleaning up. I certainly am for each school having subtle differences in style. YES, this is very important. There is some technical detail in each guru’s original approach to movement. I think those details are worth preserving. It gives dancers identity, and less of a boring uniformity. But in that framework there is room for perfection. Let us take the example of the common Thadinginathom and Kitathakatharikitathom steps. Each guru had slight variations from the other. But each had an aesthetic code. Nowadays, I find distortions going unchecked when such common adavus are done. This must be checked and corrected, before it is too late. What exactly is a workshop? There seems to be a misconception that it is meant to learn an item. It should not be so. Learning an item and doing it pronto, gets the student nowhere. On the other hand, even if they learn an item, they should watch... I mean observe seriously, learn, understand, get inspired and absorb some details. Stacking up a repertoire is a flimsy quest. When a student comes face to face with a master of the trade, she or he should benefit by actually getting an unusual learning experience. One or two points even from a whole session which lifts your own approach to another level is worth it. Does that sound far-fetched? No, on the other hand, some thinking will make the student understand that great artists are who they are, because they have thought about everything they do. So, to see their technique at close quarters and assimilate some details is important. I saw some well established cricketers consulting experts to improve their technique. It can be correcting a bowling action, a run up, an angle, a stance, a foot movement, an eye focus, whatever. Even Sachins and Sehwags do that. In the olden days, some gurus invited big vidwans and experts to see their wards dance before putting them on stage. Then, they also did some cleaning up of the dance in detail. In Tamil it was called “thirutthal” meaning corrections. Like proof reading a text! We have famous dancers who display highly visible defects in execution. Does that make the defects acceptable? NO....according to me. This is the handicap of dancers. If a musician hits a wrong note (abhaswaram), everybody except the most deaf listener is instantly put off. But audiences do not have the same visual astuteness as they have for the aural. Their eyes are not trained for that. Pretty young things doing fast numbers with lots of distortions are applauded. The kind teachers find it sort of easy to brush it all under the carpet. Over all talent is lauded. But ... To aim to be a good artist, a dancer needs to clean up her act. It takes years to evolve a flawless technique. Then only can the dance come of age as a work of Art. Hmmmm, many dancers and few artists, that seems to be the story of dance today! That is my view point. No offence meant to anyone. Dancers ...make use of master classes to learn some details. Correct yourself. And see that the flow in your dance is based on proper technique. Then pat yourself on the back! There is no harm in requesting an expert to come and see what you are doing and ask for advice. Imitating famous distortions is not worth it!